As anyone who’s spent any amount of time here will tell you, there’s a whole lot to love about Honolulu. Come to think of it, the entire island of Oahu is a pretty wonderful place to spend your time. The weather is pretty much always amazing, the people are friendly, and the food is great. What more could a person want? As such, it makes sense that people would want to live here. 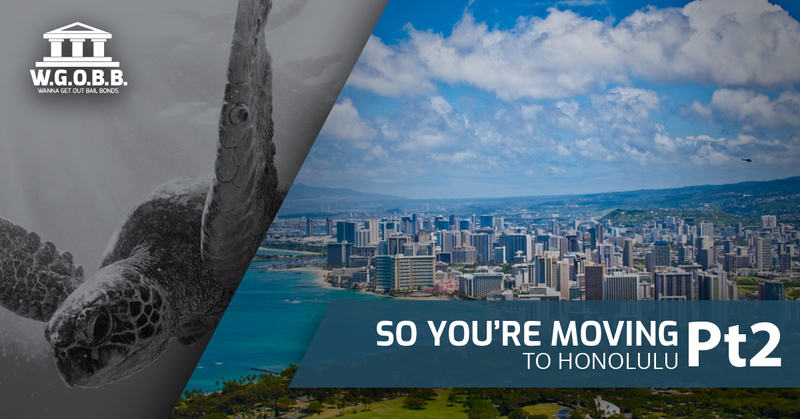 That’s why if you’re moving to Honolulu, the team at Wanna Get Out Bail Bonds would like to be among the first to wish you a warm welcome. We think that you’ll absolutely love making a life in this part of the country. Here’s the deal though — figuring out what to do when you first get here can be a challenge. You have so many options, so how’s a person to decide what to tackle first? Sure, you could do a search online and see what comes up, but wouldn’t you rather take it from the locals? As we mentioned above, it’s a wonderful place to spend some time. In part one of our series about things to do on Oahu, we shared a handful of our favorite things to try ranging from Bishop Museum to Kualoa Ranch to Koko Head Crater Trail and more. But that’s only scratching the surface, to tell you the truth. That’s why in today’s post we’d like to share a few more suggestions for what you can do first while you’re on the island. Keep reading to learn more. “Nestled in 193.5 acres of tropical rain forest at the top of the Manoa Valley watershed [and] just 5 miles from the bustle of Waikiki, Lyon Arboretum serves as a cultural and scientific resource to urban Oahu’s diverse communities,” according to the Lyon Arboretum website. If natural beauty is what you’re looking for, this is one of the absolute best places to get it thanks to the miles and miles of hiking trails that rise to nearly 2,000 feet above sea level. Perhaps best of all is the fact that admission is free to the public. It is recommended that you donate $5 per person to enter, however, but rest assured that any money you choose to give will be allocated towards preserving the natural beauty of Honolulu. A favorite of tourists, the Polynesian Cultural Center is the perfect way to get a feel for what life will be like for you on the island of Oahu. Will you enjoy a guided tour and a dinner buffet with live evening show every day? Probably not, but it’s the perfect introduction to what life should be like on the island. The Polynesian Cultural Center allows you to do everything from playing ancient games to learning how to fish without a net to discovering the significance of Maori tattoos to enjoying Samoan song and dance to tossing spears. In other words, it’s a wonderful way to get some cultural context for the island that you now call home while resting and relaxing in a way that’s only possible in Hawaii. If you want a wonderful hike that allows you to feel like you’re literally on top of the world, Pali Puka is the way to go. As you can probably imagine, there are a number of different exceptionally good places to hike on Oahu, but if you want something that’s just all-around awesome to start off with, this is the one to try. There’s a 400 ft climb involved, which means that pretty much anyone who is in reasonably good shape should be able to tackle the Pali Puka hike. With exceedingly good views of the East Side and the Nuuanu Valley, it’s a hike that’s sure to please because you’ll make memories that last a lifetime. As their website notes, “If you are not comfortable being inches away from a 2000 ft vertical cliff, this is not the hike for you.” We think it’s worth overcoming your fears for. “In the heart of Honolulu, Punchbowl crater is a 360-foot extinct tuff cone volcano that shelters and commemorates America’s fallen heroes as the Punchbowl National Cemetery.” Is there anyone in existence who wouldn’t want to see what an extinct volcano looks like? It’s quite the site to see, and that’s why we wholeheartedly recommend the trip to Punchbowl Crater. Named for its unique shape, the crater is also home to the second largest military cemetery in the United States. “Visible from almost everywhere in Honolulu, you’d never guess by viewing its overgrown outer slopes at all the scenic beauty and Pacific/Hawaii history that unfolds before you within the crater rim.” In other words, it’s truly something to behold. Another unique trail for those who are looking for hikes on Oahu, the Makapu’u Point Trail is one of the best ways to see Oahu’s southeastern coast. As we mentioned above, there’s a lot to love about life on Oahu, and the views along this hike are enough to convince pretty much anyone that they should never leave. “From the trail’s destination at Makapu‘u Head, one is rewarded with magnificent views of the windward coast and offshore islets, as well as the historic red-roofed Makapu‘u Lighthouse built in 1909, which makes a stunning picture against the deep blue sea below,” according to the website for the Department of Land and Natural Resources. For a view that will take your breath away, this trail is among the best in Hawaii. So what have we established? There’s a whole lot of fun to be had in Honolulu. That’s why if you ever have too much fun, you might need the help of a local bail agency. There’s plenty to do here that’s sure to keep you out of trouble, but at the end of the day, bad things can happen. If you or a loved one are in need of our services, we’d be glad to lend a helping hand. No matter the time of day or night, no matter the situation, we can help you make bail fast. We also offer free bond advice, and we accept collect calls. We want our clients to know that whatever else is going on, they can count on us to be honest and dependable at every step of the way. With zero interest and flexible payment plans, you can always get the help you need from Wanna Get Out Bail Bonds. Contact us today and rest assured that we’ll always be here to lend a helping hand.